1. Wash the placemat in the washing machine to remove the sizing from the fabric if applicable. 2. Put the placemat on the cardboard or newspaper. 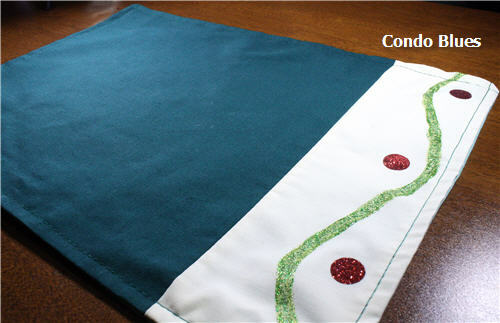 Use the paint brush and Tulip Fashion Glitter Shimmer Fabric Paint to paint a wavy line down one side of the placemat. I'm using a photo of my test piece because I skipped taking a photo of the real placemat because I was in the The DIY Zone, ya know? 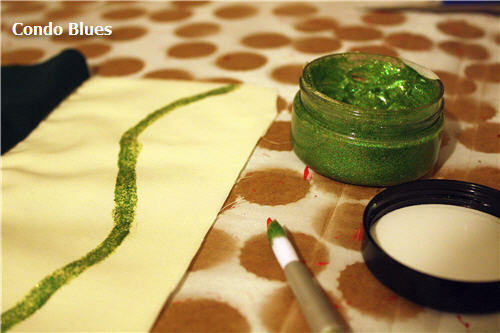 Tip: The glitter paint is thin if you want a thicker line of paint you will need to do multiple coats of paint. I used 3-4 coats of paint for my project. 3. Use the circle punch to punch a series of small circles from contrasting colors of the Tulip Glitter Shimmer Transfer sheets. You can do this with a die cutting machine, if you have one. I don’t have a fancy shmancy cutting machine. I’m kicking it old school with a paper punch. Tip: The protective plastic cover sheet means you need a little extra oomph to manually punch through it. I used scissors on a test piece and it was easier to cut than punch. 4. Peal off the plastic cover and artfully place your circles on the cream fabric. Warning: The plastic sheet side is the top side of the shimmer sheet. If you iron it plastic side down, you will accidentally iron your dots to your pressing cloth. 5. Place a pressing cloth over the design and iron the design in place using a dry iron and a heat setting suitable for the fabric you are using. My fabric is cotton. I used the cotton setting. 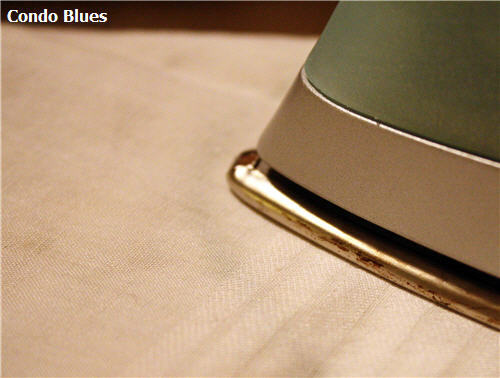 Tip: You can re-iron the design if it does not set the first time. 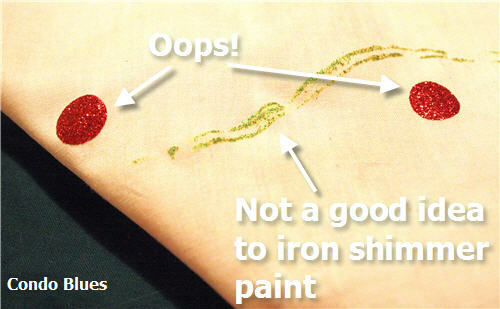 Make sure you use the pressing cloth unless you want an iron full of glitter! 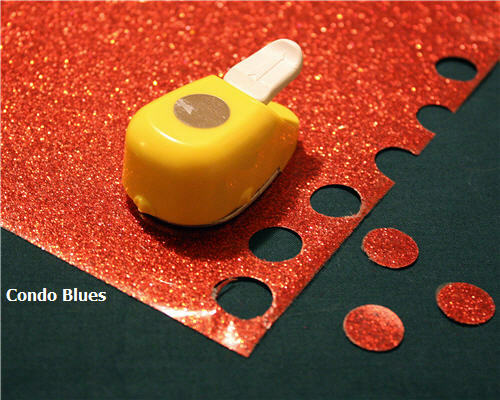 Tip #2: You probably don't want an iron full of glitter. 6. Slap that placemat on your table and chow down! Since spilling food on placemats is my superpower, I made more placemats than my table can hold. That way I have extras on hand while I wash the dirty placemats. Yep, Tulip Fashion Glitter Shimmer Transfer Sheets and Tulip Fashion Glitter Shimmer Fabric Paint are machine washable. Guess how I know? ILovetoCreate sent me an extra box of Tulip shimmer products by mistake. Since I’m always looking out for you guys, I asked them if I could give it away to you and they said yes! You will win two packages of Tulip Fashion Glitter Shimmer Transfer Sheets and 6 packages of Tulip Fashion Glitter Shimmer Fabric Paint. To enter: Leave a comment on Condo Blues telling me what you would add a little shimma shimma to if you won the Tulip Glitter Shimmer Giveaway. You must leave your email address so I can contact you if you win or your entry will be disqualified. I am not going to do anything mischievous with your email address. I just want to contact you about sending your prize to you if you win because not being able to contact giveaway winners makes me sad. 2. Follow Condo Blues on Twitter AND tweet about the contest. Please leave your user name and the URL of your tweet in your comment so I can verify it. You must leave a separate comment for each method you used to enter the contest. If you choose to use every method of entry, you have up to SEVEN chances to win! I will use a random generator to select the winner. The giveaway is open to US residents only. Tulip Glitter Shimmer Giveaway runs December 10, 2011 to December 26, 2011 12:00 midnight, EST. Disclosure: I received product and compensation for materials to design the project for this post. However, my ideas, words, and opinions are my own and are not influenced by this compensation. I love shimma-shimma! I think I would shimmer a scarf and some socks and my younger daughter would love to shimmer her sneakers. Maybe some jeans too. Now you've got me started! I'm an email subscriber to Lazy Budget Chef too. I followed I Love to Create on twitter. I'm an email subscriber to Lazy Budget Chef! I would use it on scrapbook pages and mixed media art projects to add that something extra. Thanks for the chance to win! I am an email subscriber. And I'm off to be a FB fan as well. I'd put shimma shimma on cards! I followed Condo Blues page on FB. I subscribe to Lazy Budget Chef.